Danish guitarist Mark Solborg and american trumpet player Herb Robertson are close friends. 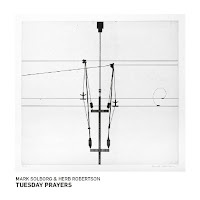 The two have been working together in different outfits in the last decade, documenting their collaborative work in the duo album NOD (Ilk Music, 2009) and later in the expanded Mark Solborg Trio with British sax player Evan Parker and Robertson, The Trees (Ilk Music, 2013). Their third recording together, Tuesday Prayers, was recorded at the old church Koncertkirken in downtown Copenhagen during the 2014 edition of the Copenhagen Jazz Festival. Solborg Trio (with Norwegian bass player Mats Eilertsen and Danish drummer Peter Bruun) augmented by Robertson had just performed three intense concerts in little than 24 hours at Kongsberg and Copenhagen Jazz Festivals before Solborg and Robertson headed to a duo concert at Koncertkirken. The intimate format and the large space with its impressive acoustics suggested a different atmosphere, calm and contemplative. Solborg and Robertson begin with two short pieces, preparations, that stress the duo immediate, free associative conversational mode. Both are sonic alchemists, exploring and expanding the timbral palette of their instruments, but deeply attentive to the sudden shifts and mutations in each other mood. Solborg and Robertson begin the concert with the meditative, minimalistic “Hymn”, that slowly evolves into an intriguing sounding West-North African kind of a chant, shining with an innocence that radiates rare, profound beauty. The 17-minutes title-piece highlights the strong personalities of Solborg and Robertson and their expressive, poetic and sometimes even eccentric language. Both follow their immediate instincts. 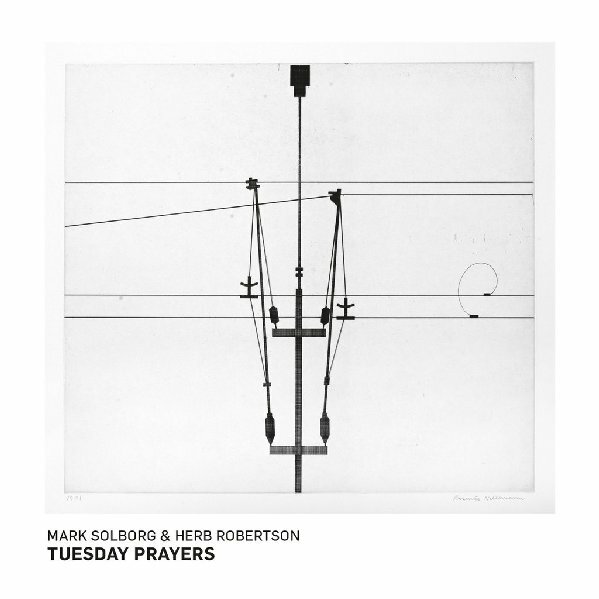 Robertson moves around the microphone and demonstrates his inventive breathing techniques while Solborg experiments with sounds, but both sculpt emotional soundscapes, separately and much more together. Solborg experiments with electronics on the fleeting “Slideswithch” before he and Solborg conclude with the “Shout, Landscape and Goodbyes”. This piece begins as an urgent, aggressive cry but morphs into a peaceful, compassionate prayer. The disc cover is a suggestive etching of Danish great painter and illustrator Rasmus Nellemann (1923-2004), “Wires 1991”. This almost abstract yet clear and transparent image resonate beautifully with the magical, inspiring music.